In Partnership with the Smiles for Everyone Foundation, A+ Dental will provide free dental services for low-income, underinsured individuals at its Roseville, California office on April 27th. A+ Dental Care is a rapidly growing group dental practice owned and operated by Herman Dental Corporation and affiliated with the dental support organization, Smile Brands, Inc. 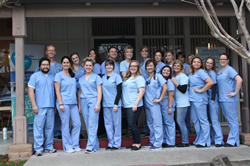 Since 1975, A+ Dental has been delivering quality care to Northern California residents. With five convenient locations, A+ Dental Care provides comprehensive general and specialty care to patients in the greater Sacramento area including the communities of Roseville, Lincoln, Rocklin and Folsom. Their mission is to create long-term patient relationships by making dental visits convenient, affordable and stress-free. A+ relies on Smile Brands to provide world-class business support services so they can focus on delivering highly personalized patient care. Learn more at https://www.aplusdentalcaregroup.com/.